Novel therapeutic approaches are necessary for colon cancer patients to prevent disease relapse and progression. The incidence rates for colorectal cancer are on the rise in patients younger than age 50, even though it mostly affects older people, as per the Colon Cancer Alliance (CCA). Xenografting is the transplantation of tissues from one species to another, with xenotransplantation of human tumor cells into immunocompromised mice serving as a widely used technique in preclinical oncology research. Thoroughly designed animal models can contribute invaluable information for gaining further understanding of drug response in humans, enabling the discovery of new therapeutic agents. The HCT116 cell line was isolated from epithelial tumorigenic colon tissue of an adult male patient with colorectal carcinoma. Rajput et al. (2008) characterized HCT116 cells in an orthotopic model and reported primary tumor growth and the ability to form additional distant metastatic colonies in lung and liver, confirming HCT116 as an appropriate model system for examining the metastatic cascade. Guo et al. (2006) used HCT116 monolayers and xenografts to study sequential combination treatment of known chemotherapy drugs docetaxel, flavopiridol, and 5-fluorouracil (5-FU) and found that tumor growth and survival rate are dependent on order of drug administration; these results suggest that dosing and order of drug administration is critical in clinical combination therapy. The last example of a study using the HCT116 model is by Wang et al. (2015) which reported the effects of the bioactive polyhydroxysteroid Bufalin on colorectal cancer (CRC). The results reported significant tumor growth inhibition and increased survival with xenograft tumors; the mechanism of action is related to upregulation of apoptotic factors (Bad, Bax, PTEN and Caspase-3) as well as downregulation of p-AKT and Bcl-xL. These results help to indicate potential combination therapies in which Bufalin may be useful. The HCT116 cell line is used to create the CDX (Cell Line Derived Xenograft) HCT116 xenograft mouse model. 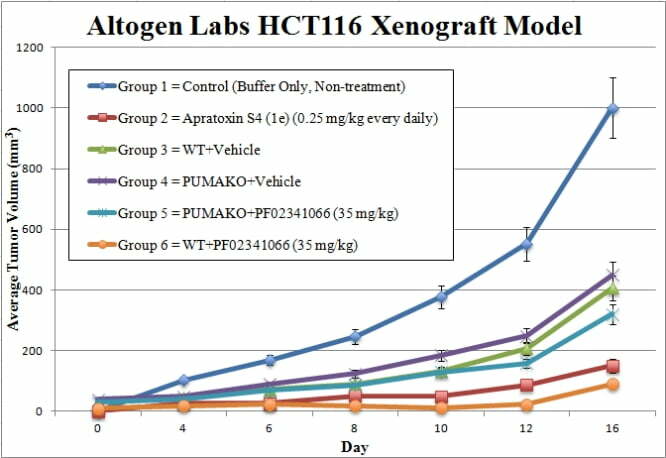 Tumor growth inhibition of a therapeutic agent (such as docetaxel, 5-FU, flavopiridol) is ideal as a single agent or in combination using the HCT116 xenograft model. Flasks are maintained at exponential growth phase prior to collection. The cells are trypsinized and cell count/viability is determined by trypan blue (min req 98% viability). Cell suspensions are then diluted to the required concentration for inoculation. One million cells of the Matrigel + HCT116 cell suspension (vol of 100 µL) is injected s.c. into the hind leg of all mice (NOD/SCID or athymic BALB/C, 10-12 w.o.). The injection sites are observed until tumors are palpable. Digital calipers are used to measure tumors. Initial grouping starts when tumors reach sizes of 50-150 mm3. Post-sorting into the required treatment groups, the test compound of interest is injected following the treatment schedule. Tumor measurements are taken daily and mouse weights are recorded (3 times weekly). As the study tumor size reaches the predetermined tumor size limit, animals are euthanized. As decided for the end of the experiment, necropsy and tissue collection is performed. Tumors are removed, weighed and documented (digital imaging). Tissues and tumors are collected for further analysis by a standard gross necropsy. CDX models are mouse xenografts used in pre-clinical therapeutic studies. However, as primary tumors proliferate they invade surrounding tissue, become circulatory, survive in circulation, implant in foreign parenchyma and proliferate in the distant tissue. This result leads to an extremely high percentage of death in cancer patients due to metastasis. Metastatic tumor mouse models are utilized to develop novel therapeutic agents that target metastasis (anti-metastatic therapeutics). To create a metastatic model, the cell line of interest is transfected with vectors containing green fluorescent protein (GFP) or luciferase. Maintained under antibiotic selection, only cells containing the integrated vector will survive. The new cell line clones are capable of stably expressing the gene of interest and are used in metastatic mouse model studies. Although each new cell line clone may contain its own inherent difficulties, the new cell line contains the ability to track internal tumor progression via bioluminescence (luciferase fluorescence after injecting luciferin) or fluorescence (GFP). Internal orthotopic and metastatic tumor growth (not palpable) can now be measured throughout the study, enabling a researcher to gain more insight and additional data in contrast to relying on end of study tumor weight measurements. An example of Altogen Labs utilizing a luciferase expressing cell line to monitor orthotopic tumor growth is exhibited below. The same ideology of tumor observation is incorporated in metastatic tumor models. Luciferase expressing U87-luc cells were implanted and tumors allowed to grow. Tumor growth was monitored in a Night Owl (Berthold Technologies) imaging system 10 minutes after an intraperitoneal (IP) injection of the luciferin substrate. As seen in the example below, luciferase expression (measured as photons emitted) in the U87-luc model grants the researcher a visual image and quantifiable metric for orthotopic or metastatic tumor progression. Figure 1. Luciferase expression in U87-luc orthotopic model. 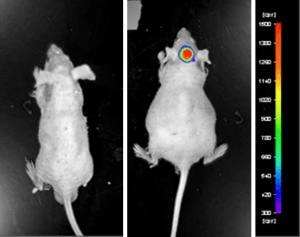 Control and implanted glioma mouse model fluorescence was analyzed 10 minutes after intraperitoneal luciferin injection. View full details of the case study by clicking here.